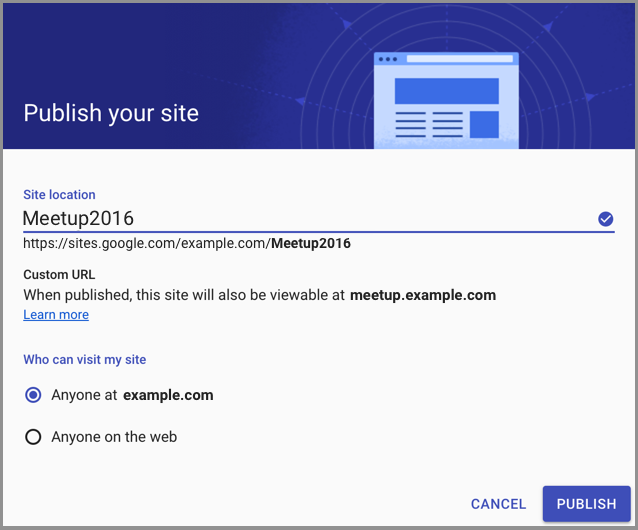 For sites that are viewable within your organization only, the link is redirected to the Google Sites URL (such as http://sites.google.com/example.com/mysite). New Sites address mappings automatically provision domain-validated SSL certificates for secure connections. You cannot use other certificates. You may need to wait up to 24 hours to see your changes reflected. This feature is not available for trial domains. As a professional organization, it’s often important that you host both internal and external info at a well-known URL. Already supported in the classic Google Sites, this is now available in the new Google Sites as well. For more information on how to set up web address mapping in the Admin console, check out the Help Center.